Fortified with additional organic compounds, our nutrient treatments are injected in a grid pattern around the base of your trees. Targeting the root zone means your trees get the maximum benefit. 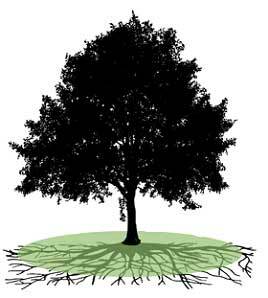 Water and nutrients go directly to your trees’ roots without runoff into surface or ground water. Traditional methods of maintaining turf, plants and trees often have negative effects. For decades, chemically-based fertilizers were recommended to care for trees and shrubs. These chemicals force excessive, new growth, which is hard to sustain during seasons of drought and high temperatures. Additionally, many routine measures, such as mowing and raking, actually remove some of the organic material nature provides to preserve tree and plant health. We know healthy trees and plants start with healthy soil. Our goal, therefore, is to mimic the forest floor by incorporating natural micronutrients and conditioners in the soil. This method stimulates the fertility and richness of your soil, which allows your trees and shrubs to better uptake water and nutrients. Our environmentally-friendly nutrient treatments also loosen and break up the compacted clay soil often found in Virginia, resulting in better growing conditions for your landscape and make it stronger and more pest & disease resistant for years to come. You will begin to see a difference after just one nutrients treatment; however, to achieve long term and lasting results, we will want to determine the appropriate frequency of application for your property’s specific needs.